Did you know that Nutmeg is not one spice but two? 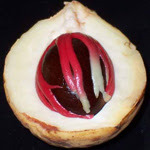 The Nutmeg tree’s pretty nice too, but you can only grow this one in the tropics. Even if you can work out a microclimate for your Nutmeg tree, it takes up to nine years before you get any fruit, plus you need a male and a female tree. What’s even more tricky, the grower wouldn’t be able to tell you what type of tree it was until it was at least six years old. Ian says add a tough of grated nutmeg to a creamy pasta sauce for that added touch of inspiration. You can grow the Australian version of the Nutmeg tree, but the fruits only faintly smell of Nutmeg. However, it’s OK in dry conditions and might be a nice addition to the native garden.If you have a question about any spices, or want to know about a spice or herb that’s hasn’t been covered in the show so far, why not drop us a line. 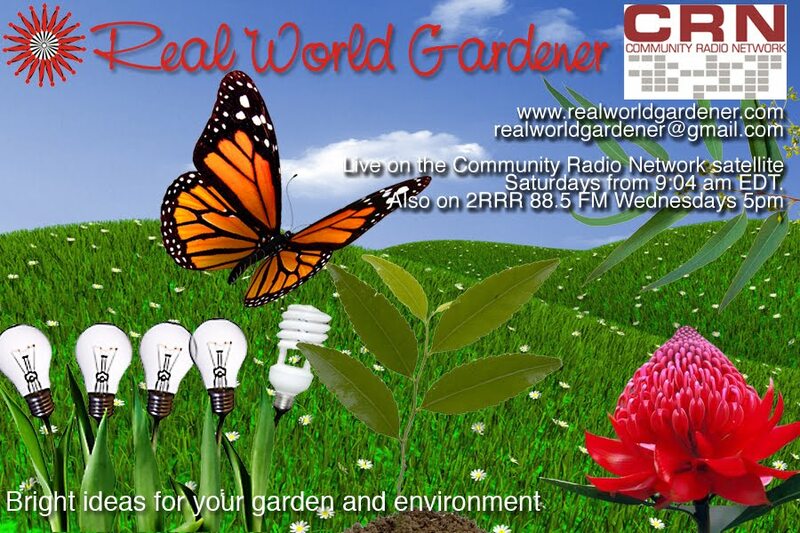 to realworldgardener@gmail.com or by post to 2RRR P.O. Box 644 Gladesville NSW 1675, or post them on Real World Gardeners facebook page, we’d love to hear from you. The answer to the question, do Lima Beans come from Lima, or Leema? Yes they do? Why you ask? Because that’s where those Spaniards first found them in Peru, in the city of Lima. Lima beans (Phaseolus lunatus var. macrocarpa syn. Phaseolus limensis), are also called Madagascar beans. Lunatus refers to the crescent shape of the bean pod. 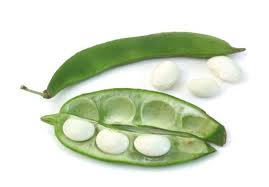 Lima beans are grown for their seeds which are used semi-mature (green limas) or dry (dry limas). Lima beans are one of the oldest beans to come out of the Americas, with remains dating from 6000 to 5000 B.C. Plants grow wild in the Amazon basin region of Brazil and seeds have been found in prehistoric mummy pits in Peru. Why are we growing Lima beans, aren’t there plenty of other bean varieties? Lima beans have a few special qualities-they’re tasty when they’re fresh, and they have health benefits that are the highest for any bean. Have you ever seen fresh Lima beans being sold anywhere? Probably not, but I’m sure you’ve seen the speckled white and maroon dried seeds. So it’s a good idea to grow some of your own. Lima bean pods are a little different looking than most climbing beans. The pod of the lima bean is flat, oblong and slightly curved, averaging about 71/2cm in length. Inside that largish pod are the two or four flat kidney-shaped seeds that we call lima beans. The seeds come in various colours, but the ones available in Australia are usually the cream and maroon flecked versions. Most beans are grown during the warmer months from spring through to early autumn. Broad beans are the only beans that are grown from autumn through to spring. To germinate properly, lima beans need warmer soil than snap beans. They also need higher temperatures and a longer growing season for a good crop. Lima bean seeds require soil temperatures of at least 180 Celsius for a minimum of five days to germinate. They should be planted two weeks after the average date of the last frost. In temperate and arid areas, sow beans from September until January, In warmer areas-sub-tropical and tropical, sow these beans from August until April, and for cool temperate districts, you have September until the end of December Lima beans are usually grown as fast growing annuals and should be direct sown or planted out after all the chance of the last frost has passed. Lima beans are also better at coping with wet, humid conditions than other bean varieties. Lima beans needs a sturdy trellis because of the way it grows-rather sprawly and vigorous. Lima beans, like a lot of vegetables like to grow in full sun, in a well drained soil that is pH neutral to alkaline. That’s of course ideal. These beans tolerate a wide range of soil types too but drainage is essential otherwise they’ll get root rot. If your soil is boggy, grow them in a mound or raised bed. A good idea is to add Potash and blood and bone. The bean seeds are quite large so don’t sow them too close to the surface, or the seeds will dry out. Sow them at least 2-4 cm deep. Mulch around your beans thoroughly because beans are shallow rooted and are easily damaged if you’re weeding around them. Lima bean seeds grow best when you water them deeply after sowing and wait until the first set of true leaves appear before you water again. Once they’ve grown a bit, if it doesn’t rain, they need about 1cm of water per week before flowering and about double that or 2cm of water every week from flowering through to harvest. If you don’t five them enough water during this flower period and during pod set, you’ll end up with less beans because the plant will drop the flowers or pods. The beans (not the pods) can be eaten fresh, while still white before any colour shows. They also dry well on the vine to a beautiful speckled red and white bean that can be stored for winter soups and casseroles. Lima beans also freeze well or can be left on the plant to grow into large, dried seeds which can be used in soups and stews. If you’re having trouble sourcing the seeds of Lima beans, why not buy a packet of dried beans from the supermarket? These dry lima beans, will need to be soaked in some water for 3 or 4 hours. No more than a day. After you plant the bean, the bean will open up by itself. Very lightly firm down the soil mixture around each bean. Make sure you keep the beans in as much sun as possible. Did you know that all beans are an excellent source of dietary fibre? The health benefits of Limas beans outperforms other beans with much higher levels of folate and magnesium. Lima beans also provide your body with vitamin B6, niacin, they’re a good source of protein- including amino acid and lysine, fibres, iron, and potassium. Also, lima beans have very little fat. People like to visit gardens to overseas because without looking down our noses at Australian gardens, some of these gardens are really really big, and really really old. The size of gardens in England for example that I saw this year, was mind boggling, even awesome. But what can visitors get out of these gardens, because they seem to be just too big, with too much to take in. Well, you can take inspiration from these gardens if you just select one part of them. This month, Louise and I are undertaking a trip to a few a these gardens for inspiration. The red border at Hidcote was one fairly small part of the overall garden. But it was a section that could easily be re-created in any garden, even a native garden. What did you think of the plant choices? 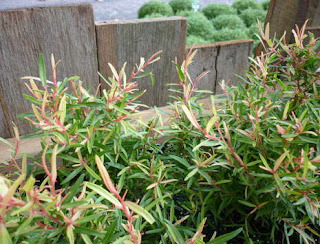 Are you inspired to plant out a few more red plants-red leaved plants that is in your garden. Not bright red, but the deep reds of maples and some of the strappy leaved plants. NEW RELEASE -dwarf selection of Lemon Scented Tea Tree Lemon, Lime and Bitters. Lemon, Lime and Bitters is a mixed drink made with lemonade, lime juice or cordial, and bitters. When you first look at this new tea tree, you probably won’t be able to say that the drink has anything to do with this plant, but who knows, the secret may yet need to be revealed. Tea trees are in the Myrtaceae family along with Eucalypts, Corymbias and Melaleucas. The parent plant of Lemon Lime and Bitters is Leptospermum petersonii or Lemon Scented Tea Tree. L. petersonii is a rounded shrub to 4 m high by 3 m across. Leaves are narrow-lanceolate, to 4 cm, and strongly lemon-scented. It’s an upright tree with weeping outer branches. White flowers, 1.5 cm in diameter, occur in spring and early summer. Will grow in full sun or partial shade, even for half the day. Tea trees are generally hardy and will grow in any soil, even soils that are inundated for a while. You could even say that will withstand neglect for some time and will grow in clay soils that have moderate drainage. Lemon Lime N Bitters or Ell Ell ‘n Bee leaves are full of citronella oil and it’s covered with white teatree flowers in spring, which the butterflies love. Moist clay loam or sandy soils in cool temperate to sub tropical climates will suit just fine, and you decide its shape by how little or how much you prune it. This dwarf selection grows 50cm high and wide. Sounds a great alternative to low box hedging and quite a bit more colourful too. I’ve been given a sample and the leaves are nowhere near that bright green of Buxus. More colourful –a sort of greeny-red. Problems with Tea Trees Solved. Frost tender when young so cover with fleece or protect with a screen when they're young. It’s said they have a problem with webbing caterpillars. I have this problem in my Melaleuca “Claret Tops.” Webbing caterpillars feed on the foliage of most of the small-leaf species, matting the leaves together with webbing and filling it with their droppings. What can then happen is all the leaves can drop off, ie defoliation in small plants and may even cause death. The easiest and safest means of control, if the problem is found early enough, is to remove the mass of grubs, webbing and frass with the fingers and squash it. Hard pruning the affected area has been my solution. Pruning of tea trees isn’t necessary, but it can be hard pruned into hedging if you wanted. After all that, Lemon Lime n Bitters isn’t such a bad name for this colourful shrub. Firstly it has a lemon scented leaf and secondly, the leaves come in three colours foliage, yellow, green and reddish. Use this mounding plant in rockeries, mass plantings; hedging and low borders. Team it up with Grevillea oxyantha, or any other small leaved grevillea, like G. speciosa, or Firesprite, and enjoy the result.